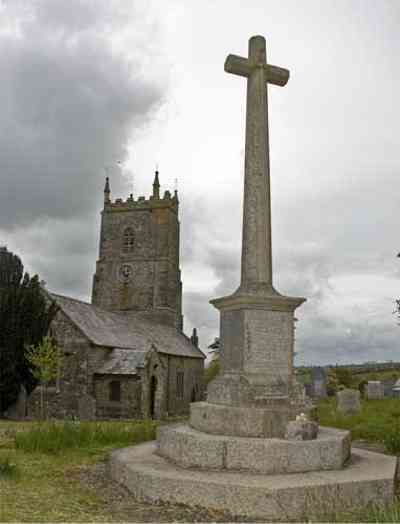 The War Memorial stands in a prominent position on a corner of the churchyard facing the main street. Sadly, the face bearing the names of the war dead is now badly weather-worn and in need of some restoration - even the solitary name for World War 2 is becoming difficult to read. 28095 Private William Henry Dingle of the 1st Battalion., the Somerset Light Infantry. Son of the late Thomas and Elizabeth Dingle. Born in Sydenham Damerel in the September Quarter of 1898. Died 22 August 1918 aged 20. G/76107 Private Tom Eggins of the 1st/4th Battalion, the Royal Fusiliers Son of the late William Eggins and Elizabeth Marlow, of Park, Chillaton, Lewdown. Born in Milton Abbot in the March Quarter of 1899. Died 23 August 1918 aged 19. 290785 Private Montague Guy Pethick ("Montie") of the 9th Battalion, the Devonshire Regiment. Parents not yet known. Born in Egloskerrie, Cornwall in the September Quarter of 1898. Died 26 October 1917 aged 19. 202280 Private Edwin Reddicliffe of the 1st/7th Battalion, the Worcestershire Regiment. Son of William and Mary Reddicliffe (née Langman). Born in Stowford in 1885. Died 18 November 1917 aged 32. Second Lieutenant Thomas Henry Wonnacott of the 3rd Battalion, attd. 1st Battalion, the Devonshire Regiment. Son of Eri and Elizabeth A. Wonnacott, of Hardicott, Tavistock; brother of Eri (see above). Born in Milton Abbot in the March Quarter of 1895. Died 9 May 1917 aged 20. 622605 Private Hedley John Woolway of the 43rd Battalion, the Canadian Infantry (Manitoba Regiment). Son of the late John Woolway and Elizabeth Woolway. Born in Cullompton July 9, 1892. Died 12 August 1916 aged 25. He had Canadian Nationality and is listed on the Canadian Virtual War Memorial..
T/207035 Private George Yole of the 11th Battalion, the Queen's (Royal West Surrey) Regiment. Son of Matthew and Ann Yole, of 7, Taylor Square, Tavistock. Born in Milton Abbot in 1882. Died 1 August 1917 aged 35. 148536 Private Fred Yole of the 78th Battalion, Canadian Infantry (Manitoba Regiment). Son of Mrs Ann Yole, of 34 Fitzford, Tavistock. Born in Milton Abbot in the June Quarter of 1893. Died 9 April 1917 aged 24. He is commemorated on the Canadian Virtual War Memorial under the name of Frederick Yole. D/JX 154346 Leading Seaman George Henry Cockwill of the Royal Navy, HM Submarine Pandora. Son of George and Rosa Mayhew Cockwill (née Whiting), of Kelly, Devon. Born in the Okehampton area in the December Quarter of 1921. Died 1 April 1942 aged 20.